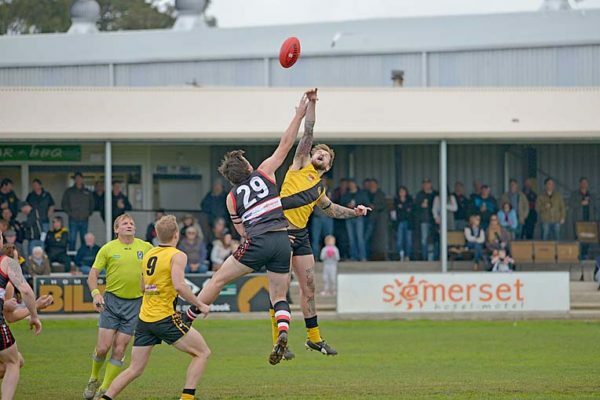 WEEKLY HONOURS: Brett Kennedy taps the ball down to Brock Egan during the Tigers’ big win over Millicent at McLaughlin Park on Saturday. His efforts were rewarded with the K&S Fuels Player-of-the-Week honours. 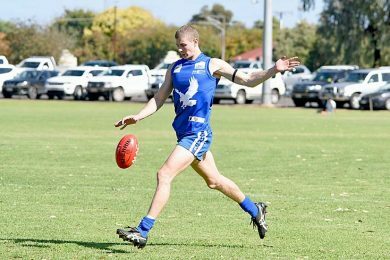 RUCKMEN have always played a major role in football, with their skills often under scrutiny, while also overlooked by many. Clearly a good ruckman can have a major impact on a contest, providing run out of the centre to his roving players. In recent weeks North Gambier ruckman Brett Kennedy has earned raps from Tigers coach Winis Imbi.